Today's card was inspired by Anita Bowden's lovely card (shown at the bottom). I loved the clean and simple flowers with the greeting, and knew exactly what I wanted to do. The only thing that I really had to decide on was what type of card I wanted to create. I settled on "Thanks" because I can always use thank you cards. To create this card, I stamped the upper flower and masked it off, I then stamped the second flower and the leaves to create a one layer look. The masking allows you to create the look of dimension without actually having dimension. The flowers and leaves are coloured with copics. 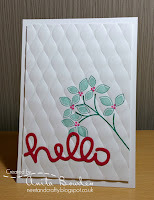 I die cut the greeting using Lawn Fawn's "Thanks" die, three times and stacked them together. I coloured it using the darkest orange from the flowers and adhered it in place. To create a matching boarder, I used the same orange and just coloured along the edges of my layering piece to tie the card together. I would've moved the "thanks" over to the right so that none of it actually touches/overlaps the flower piece. I love the subtleness of the orange border. Your card is quite cheerful. Beautifully done. Very pretty card, I love the flowers! I love the bright colours - this is sure to bring a smile! So glad you joined us at Muse this week! Great masking and I adore those colours you used. So glad my card inspired you. So beautiful and the colors ar gorgeous I love this card and wonderful colors!